One week on from Curiosity landing on Mars, the rover has started sending back some pretty intriguing pictures in high-resolution colour of the landscape. Here are our favourite images so far. Curiosity has a long way to go before she can even move out of her new home on the bed of the Gale Crater, but some magnificent photos are already coming back from Mars — first in 3D, and then in high-resolution colour. 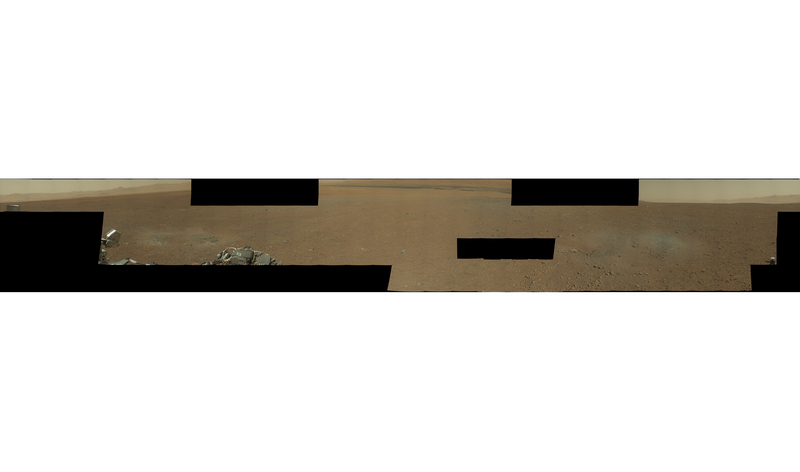 Of course, Opportunity has been snapping away up there for eight years, as seen in this glorious interactive panorama, but the more the merrier, right? 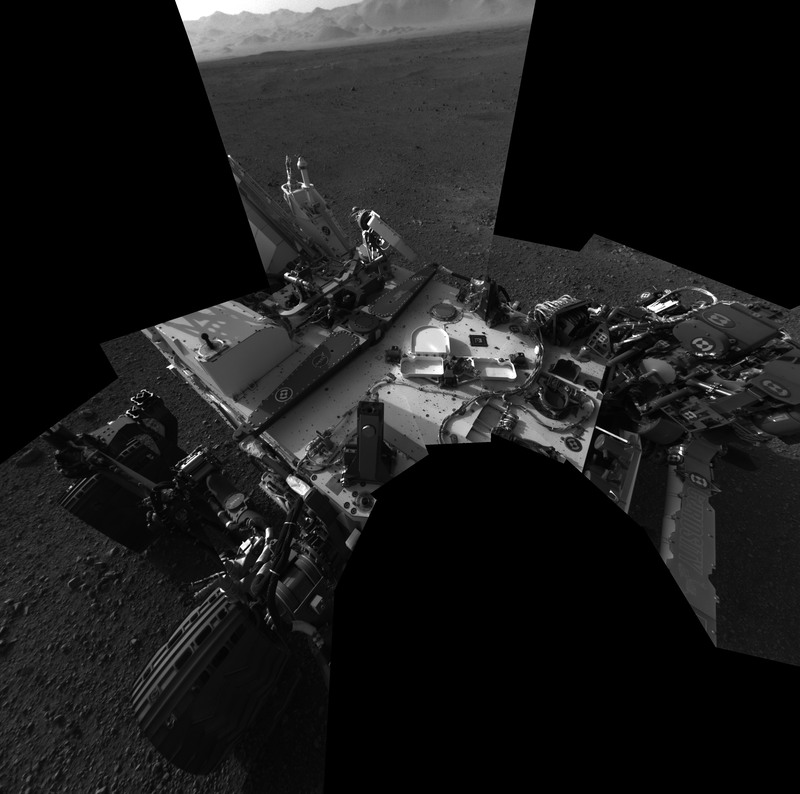 The images that have been sent back so far were taken by seven cameras mounted on Curiosity's mast. 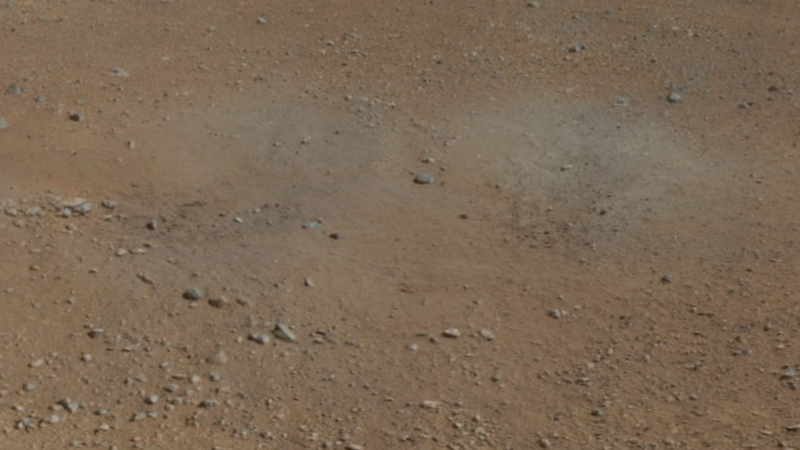 Curiosity's landing did not leave the Mars landscape unscathed. 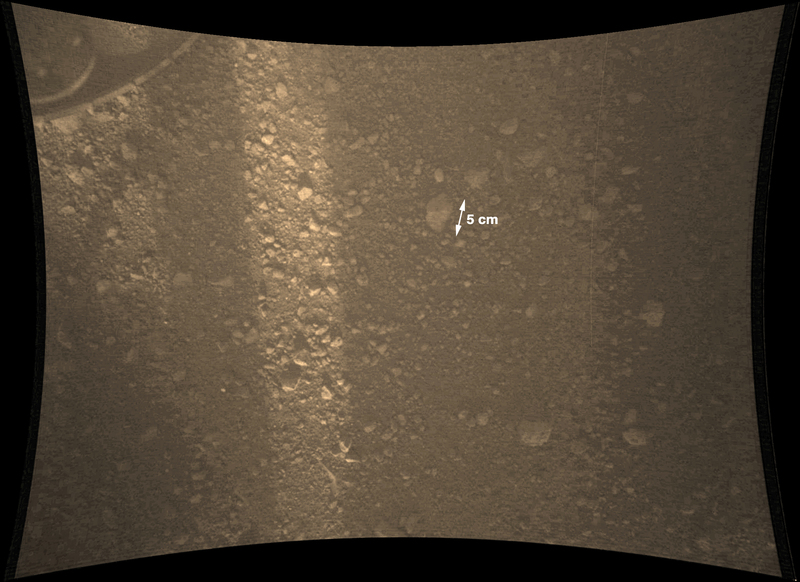 This image, taken from a larger panorama, shows a small excavation that was left when the rover made touchdown. See the full-resolution image here. In the distance, the wall of the Gale Crater, where Curiosity made its landing, tantalises at an entire world to be explored. NASA scientists believe that the wall may have been shaped by water erosion over millions of years. This global map of Mars was taken by the Mars Color Imager (MARCI) instrument on NASA's Mars Reconnaissance Orbiter on 5 August 2012. It makes one map per day, so that NASA scientists can calculate weather conditions. The area around the Gale Crater is clear — perfect for landing. 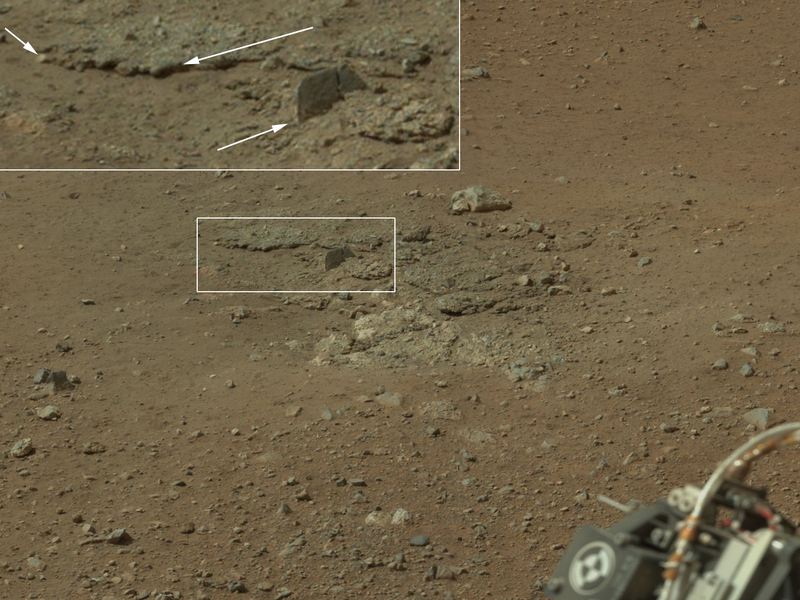 Up close, in this section of a larger panorama, we can see more of Curiosity's blast marks discolouring the ground. Curiosity's destination, Mount Sharp, rises from the middle of the Gale Crater. You can see its foot to the left, beyond the blast marks. 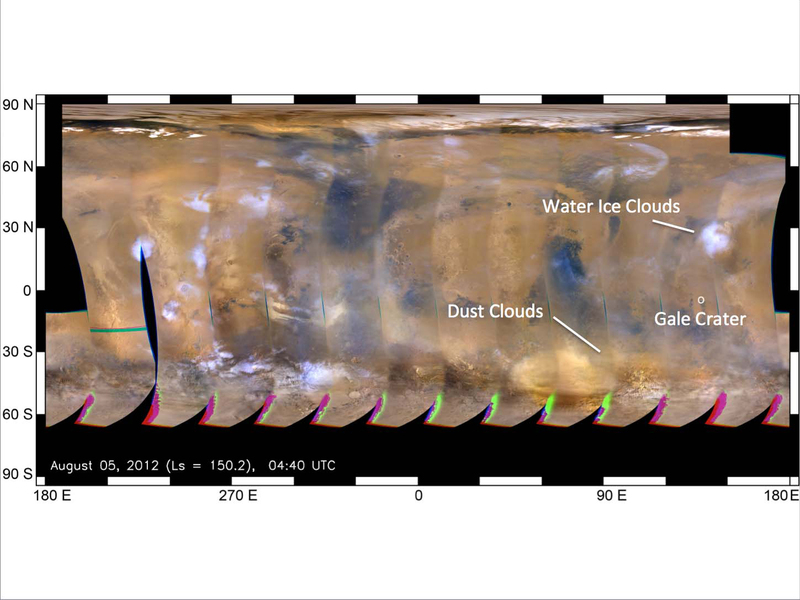 NASA's scientists will be taking a closer look at those marks, as well as at the different-coloured dunes farther back, which indicate different textures and materials. Curiosity's full-resolution self-portrait, taken by the mast camera, is made up of eight 1024x1024 images tiled together. In the background, you can make out the lighter-grey craggy rim of the Gale Crater; on Curiosity's deck, you can see a sprinkling of Martian gravel, with pieces about a centimetre in diameter. Curiosity's 4.5-metre heat shield is deployed as the rover makes its descent. 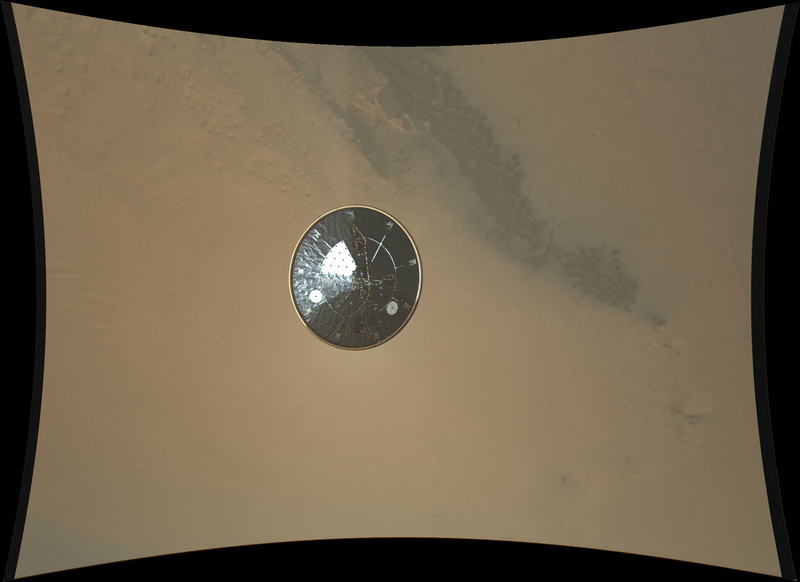 This view shows the inside of the shield: the brighter patches are calibration targets for the Mars Descent Imager (MARDI) instrument that also took this photograph. You can also make out the Mars Science Laboratory Entry, Descent and Landing Instrument (MEDLI) hardware attached to the heat shield. We love this picture for how simultaneously normal and strange it looks — like something out of a 1950s B-grade sci-fi film. It shows the rocky surface of the gale crater, with the rim in the distance. This is Curiosity's new home. It certainly says something when even dirt is exciting. This is the surface of Mars, as seen through MARDI's lens. A sliver of sunlight leaks through the equipment. Although this image is in full resolution, it is slightly out of focus because the camera is only about 70cm from the ground. We love this self-portrait in various resolutions, as it seems to hint at a personality. 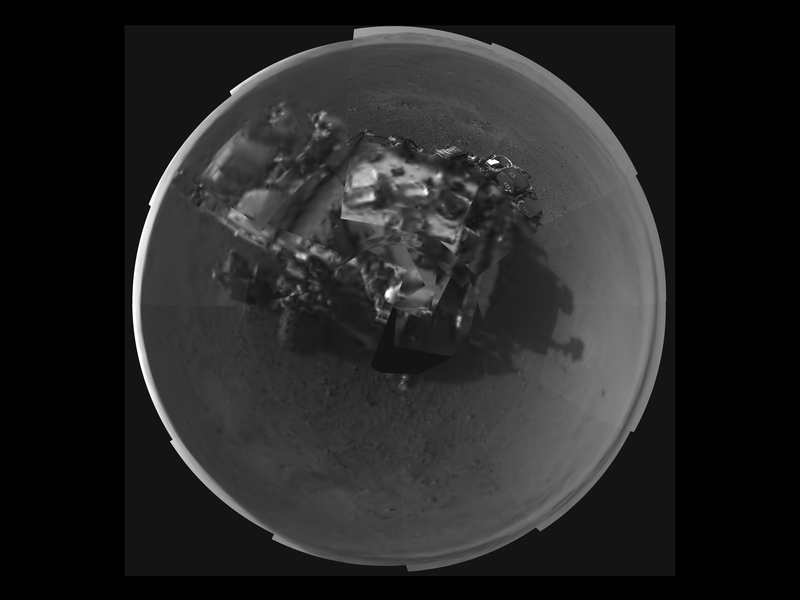 It was taken by the navigation cameras on Curiosity's mast, which took the pictures in a 360-degree rotation around the rover, pointing down and straight ahead to create a fish-eye effect. We've shown you this one before, but we just love it so much. 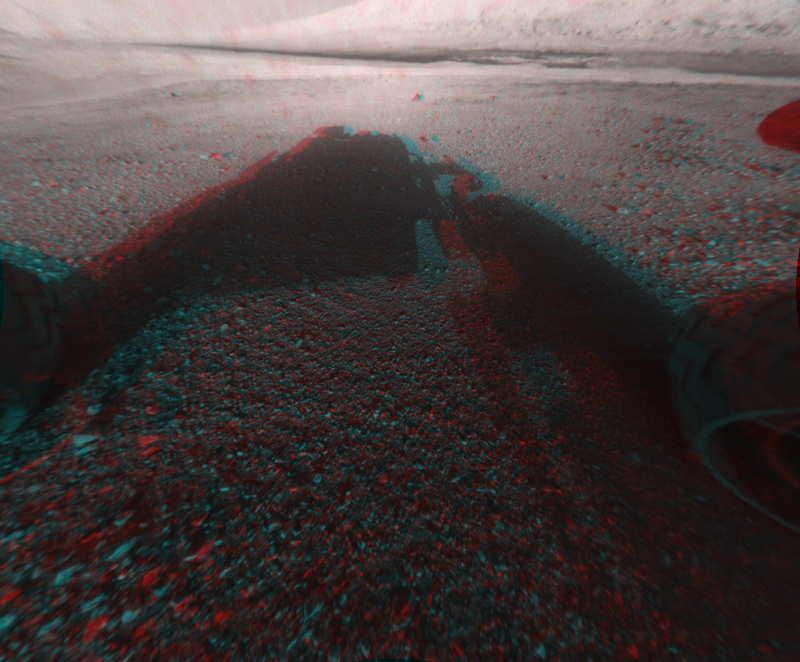 It's Mars in 3D, and is almost like being there, but also once again recalling old picture shows. It was snapped by Curiosity's front-left haz-cam in full HD, and shows the very foot of Mount Sharp beyond Curiosity's shadow. You really do need to click on the full-resolution image to get the full impact of this photograph. It's the first full-res colour mosaic panorama taken by Curiosity, showing the geological landscape of the Gale Crater around the rover's position. It's a little washed out — the colour difference between what the camera sent back and what the human eye would see is probably similar to the difference between a mobile phone picture and real life. NASA said: "The parts of this mosaic that are most interesting to geologists include a section on the crater wall north of the landing site where a network of valleys believed to have formed by water erosion enters Gale Crater from the outside. 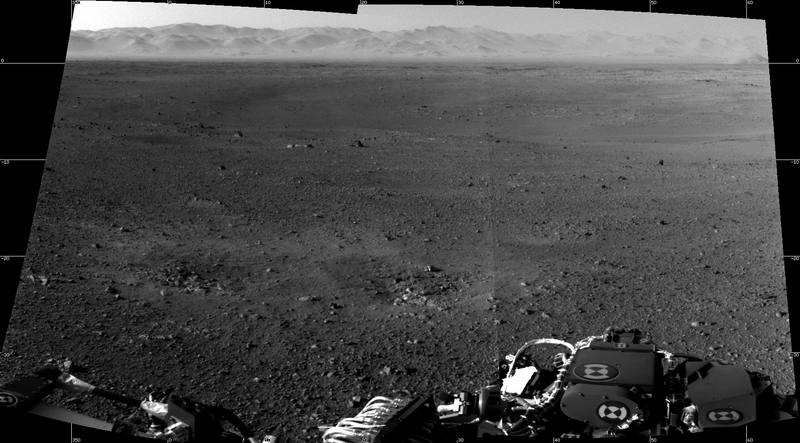 They are also studying a section that looks south of the landing site that provides an overview of the eventual geological targets Curiosity will explore, including the rock-strewn, gravelly surface nearby, the dark dune field and the layered buttes and mesas of the sedimentary rock of Mount Sharp." 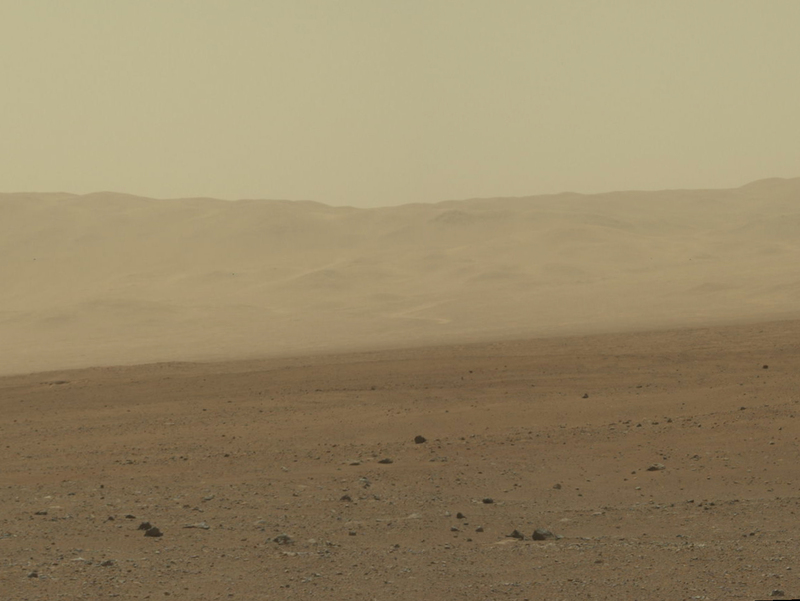 The panorama was stitched together from a 79-image mosaic acquired by the 34-millimetre Mastcam over the course of about an hour. The black patches are areas for which Curiosity has not yet sent back photos. 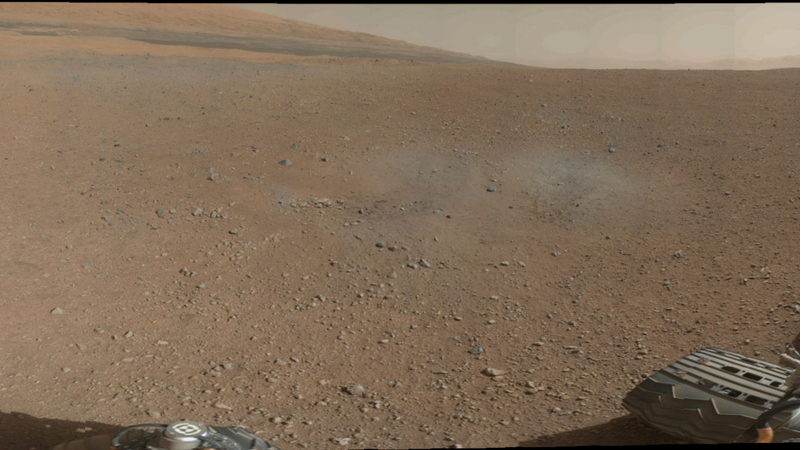 This represents all the high-res colour images sent back by Curiosity so far.